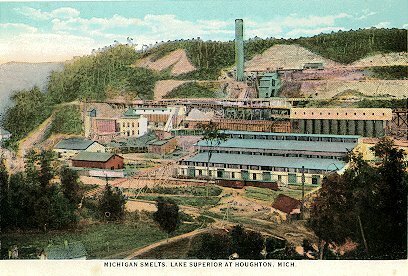 Michigan Smelter on Coles Creek. From an early postcard. The Michigan Smelting Company was created in 1903 to handle the concentrate from the Atlantic,Trimountain, Champion, Mohawk, Wolverine, and Michigan stamp mills. The location was a steep hillside two miles west of Houghton near Coles Creek. The smelter was capable of producing 90 million pounds of refined copper per year.